On September 16, 1784, a young woman died shortly after giving birth to her first child. She and her husband had been married just short of a year, and she was only 26 years old. They had courted for more than five years amidst the turmoil of the American Revolution. The young man was a patriot and the young woman’s father was loyal to the British crown. At 20, she fled Connecticut to Long Island with her family. Her diary, now housed at the Connecticut Historical Society, reveals how she agonized about personal, political, and religious issues, and her sadness about leaving the young man she had hoped to marry. Once the Revolutionary War was over, the couple reunited, married, and planned a life together. Sadly, their life together was cut short after their daughter, Sophia, was born. The story of this young woman, although heartbreaking, is not much different from many other women in the 18th century who faced difficult lives and often died young. However, this woman’s name lives on and is immediately recognized by American Folk Art historians, museum curators, needlework experts, and even contemporary artists because of her singular talent. The young woman was Prudence Punderson, and she created what is considered to be one of the most spectacular pieces of needlework in American history. In 1963, the Connecticut Historical Society acquired the needlework picture that Prudence called “The First, Second and Last Scene of Mortality.” In the words of Harvard historian, Laurel Thatcher Ulrich, the needlework is a unique “meditation on life’s transience.” The needlework depicts Prudence herself as a fashionably dressed young woman sitting in the center of a room . 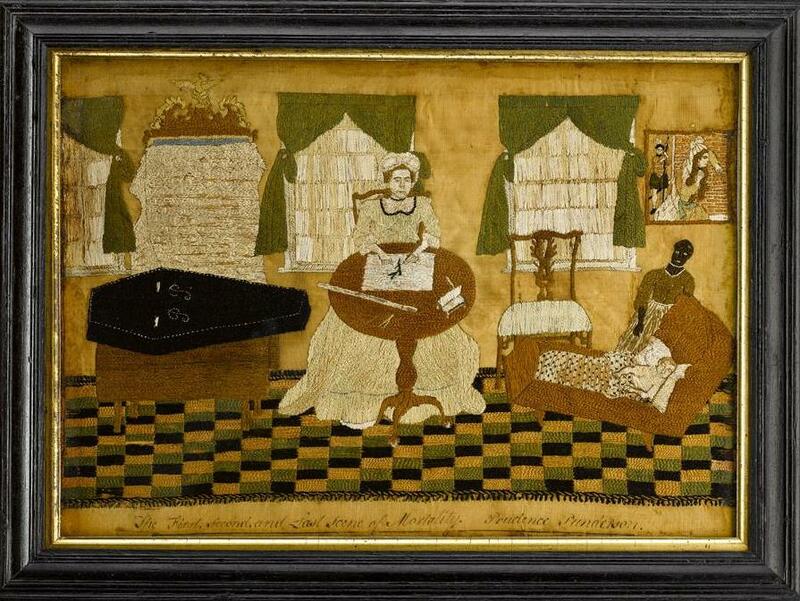 To the right, a black woman rocks a white baby in a wooden cradle, and to the left a black coffin sits on a table with the initials “PP” (for Prudence Punderson). Prudence was not only an accomplished needleworker, she was also a creative and ingenious artist, whose vision of life’s brevity continues to speak to us today. For example, contemporary artist Kiki Smith incorporated elements from Prudence’s picture in her 2010 exhibition Kiki Smith: Sojourn at the Brooklyn Museum of Art. “Connecticut Needlework: Women, Art, and Family, 1740-1840 - Digital Collections.” Connecticut Historical Society, 2013. Link. Connecticut Historical Society, and Susan Prendergast Schoelwer. Connecticut Needlework: Women, Art, and Family, 1740-1840. Hartford; Middletown, CT: Wesleyan University Press, 2010.